Taz Hair Co.: Where the atmosphere is low-key and the standards are high. If you’re looking for a salon that has a diverse roster of talent, pay attention! 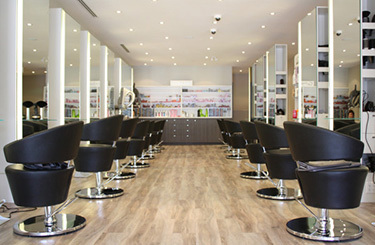 If your ideal salon is warm, welcoming, and attractive, we’ve got what you’re looking for! And if your ideal stylist is open-minded, well-trained, and knowledgeable about all things hair, you’ve come to the right place! Between them, Taz stylists have won some of the most prestigious awards in North America. Since 1997, Daniel Naumovski, Rino Balzano, and Frank and Carol Cini have been using the best techniques and styling tricks in the industry, and now it’s time to discover this for yourself! The team and their work has also appeared on fashion’s runway during Fashion Cares, Buy Design and Toronto Fashion Week, as well as on television networks such as City, CanWest Global, Fashion Television, ET Canada, The Marilyn Denis Show, LIFE and MuchMoreMusic. While they continue to be multiple NAHA-, Contessa- and Mirror-award winners, Taz remains true to its roots: hair behind the chair. The salon’s clients are and always will be the team’s first priority; each cut and colour reflecting Taz Hair Co.’s dedication to fabulous style. Ultimately though, their accolades take back seat to salon work and their clientele. “What we do in the salon is what’s really important,” says co-owner Frank Cini. “Our clients are our barometers. If our skills don’t produce results that please them, they’ll stop coming to us. For us, having a satisfied clientele is the truest sign of success.” Those signs are everywhere you look at Taz. The rarely empty chairs are occupied by smiling clients. Brides and bridal parties mingle with businessmen and women, mothers and trendy twenty-somethings. As one client said, “Taz is like a popular restaurant. It’s always busy and you have to book ahead.” One thing is for sure, if Taz’s atmosphere doesn’t bring you back, the quality of their work will.